Discussion in 'Transformers Movie Discussion' started by Shockwavers, Jan 9, 2019. How about this one? Good clear image. Studio Series get to producing. Personally, I feel like the protoforms are easily the ugliest/worst designs in the movieverse (if not the brand as a whole). I'm actually really glad they're straying away from that direction. The protoforms were never even meant to be seen for extended sequences, so I don't think they ever would have considered using them, at least for Autobots. I suppose they work as generic Decepticon stormtroopers (although the Seekers here work much better), but I can't see them returning nowadays to represent Autobots. After the first movie a lot of fans trashed the protoforms. I'm one of the few that liked them. It was a convincing way to re-introduce transformers in a real life approach. Don Figueroas designs also was received poorly. So unfortunately they may never appear again. What were they thinking with those faces (Ironhide and Cliffjumper in particular)?! That is ugly! Annoyed about the discarding of that UNIQUE design of Optimus Prime. Wheeljack and Soundwave look better in these concepts, I like the latter's angularity. Blimey..
Eh, still better than a lot of the worst Bayformers head designs. Que still gives me nightmares. To me I feel they relied to much on looking like machines, and never really looked like they would work in a every day cybertron. (Especially the decepticons) but the newer designs get that feeling from me. I could actually see ironhide hanging out at a bar or something. I loved the bay designs for their unique take in transformers, but I feel this is the way to go. It doesn't work for everyone. But it made sense to me. A little more color and it would've been amazing. I think I get what you're saying. I don't think there's anything wrong with the idea, I just didn't like the copy-paste nature of them in execution. It gave them a battle droid feel. Even if their pre-earth forms look more alien and stripped-down, I wish they at least had variation. I mean, I get that there were budget limitations back in 2007, but I'd have enjoyed seeing them colored differently, and maybe with different heads and some body details. The comic handles it well, by keeping the basic Protoform structure, but making them look distinct and visually interesting. please please please please continue down this path! Seriously though, I've never liked the human faces applied to these Transformers, they don't fit together (in my opinion, since people keep thinking I'm trying to tell them what to think. I am not. I'm just wanting to argue my viewpoint and justify my distaste for these bland designs)..
Yeah the Ironhide face in the concept art seems off, and a bit strange. The face we got with the final one I think ended up better (based off 1 pic of the final model). Really wish we got to see him talk, would have probably made it look a lot better when moving. 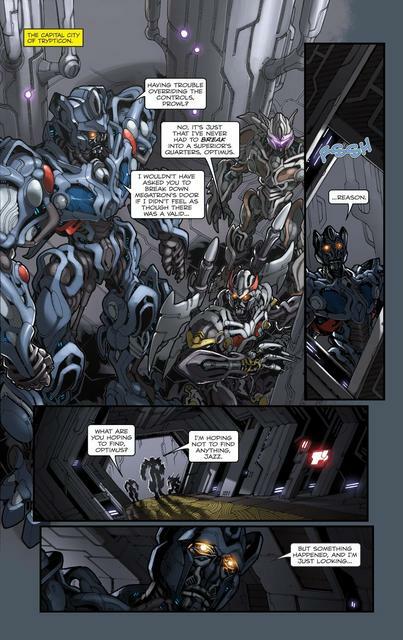 The comics is how I always pictured cybertronians to look in a future film. Ok you got me with that one. Doesn't change my opinions though (although refuting my arguments seems not to have been the point of this anyway). Funny, because every comment you make about Bumblebee is jab at it and how inferior it is to something in the Bayverse. Que is implied as being a scientist and engineer because he literally looks like a famous scientist. That's not being clever, that's being lazy and in fact, it's stereotyping. Wheeljack (who Que really is) has unquestionably been a scientist and an engineer for many generations without having to mirror a human scientist in looks, instead, he has conveyed that fact through actions and his interactions with in the world. Ironhide looks like a large brute. His face doesn't convey anything more than that because it doesn't have to. His actual personality will do the rest. Human-like faces have been apart of Transformers since its inception and generations that came afterwards. They've worked for a while now. You know, it's funny you say this as a negative aspect of Cliffjumper when Que mirrors a human face at a much higher extreme. Funny, because every comment you make about Bumblebee is jab at it and how inferior it is to something in the Bayverse. Que is implied as being a scientist and engineer because he literally looks like a famous scientist. That's not being clever, that's being lazy and in fact, it's stereotyping. Wheeljack (who Que really is) has unquestionably been a scientist and an engineer for many generations without having to mirror a human scientist, instead, he has conveyed that fact through actions and his interactions with in the world. Ironhide looks like a large brute. His face doesn't convey anything more than that because it doesn't have to. His actual personality will do the rest. Human-like faces have been apart of Transformers since its inception and generations that came afterwards. You know, it's funny you say this as a negative aspect of Cliffjumper when Que mirrors a human face at a much higher extreme. Bloody hell, keep your hat on! I'm not trying to push an agenda. As for my jabs - they're solely at the designs. I don't mention the other aspects, because that's not my point of discussion. I'm also not trying to push that Bayformers is better - I know, believe it or not, that it's much less than perfect. I just prefer the designs of those films, and I don't agree with the new ones. This doesn't immediately mean inferior. I think my words are being taken a bit too seriously/personally, I'm expressing my opinion. Might be my fault that the slight hyperbole isn't communicated well. Furthermore - I disagree on the argument of Que's (and other 1-3 Bayformers faces) resemblance(s) to human faces. They are mechanical components, not usually attributed to a face - arranged into such a shape. Take it apart and you wouldn't know that they make a face. BB's Cliffjumper, IN MY OPINION, does the complete opposite, with its (I think excessive) parts composing his face shaped weirdly organic, not so mechanical. I'm amazed you're trying to argue that Que doesn't look like he has a human face when he literally has a face of a famous human scientist. I love the commitment here. Que doesn't have random unrelated mechanical parts, he has a metal mustache, a monocle, a metal mustache, and actual hair. Well, yeah, if you take away the parts that make a face, it wouldn't look like a face, though, not sure how that has anything to do with Que not resemebing a human. Cliffjumper does it differently, I agree, but that's because they didn't try to push to the extreme. He has a simple structure of a person's face, but he doesn't directly resemble a real-life person like Que (or Bulldog or Drift for example).